The Smart Gilas Pilipinas lineup for Dubai International Tournament 2013 has been released by the Philippine men's basketball national team head coach Chot Reyes through his official Twitter account. The 24th Dubai International Basketball Tournament will be held at the Al Ahli Club. 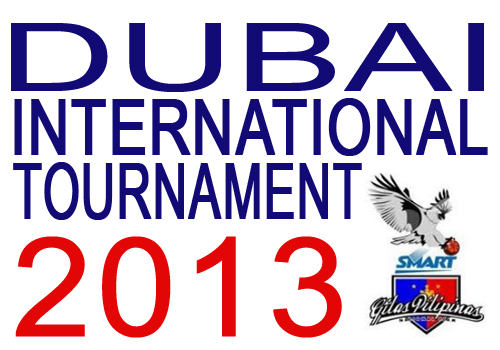 Dubai International Basketball Tournament 2013 will begin on January 10 and it will end on January 19, 2013 at the time of 5:00 PM - 11:00 PM (Dubai local time). Here's the complete list of names of the roster that tweeted by coach Chot Reyes. The lineup are composed of the following, Marcus Douthit, RR Garcia, Jake Pascual, Garvo Lanete, Greg Slaughter, Ronald Pascual, Kevin Alas, Jay-R Reyes, Matt Ganuelas, KG Canaleta, Ronjay Buenafe and Justin Melton. Meanwhile, the two reserved roster are Japeth Aguilar and Isaac Holstein, according to coach Reyes. Comments or suggestions about "Smart Gilas lineup for Dubai International Tournament 2013 Released" is important to us, you may share it by using the comment box below.